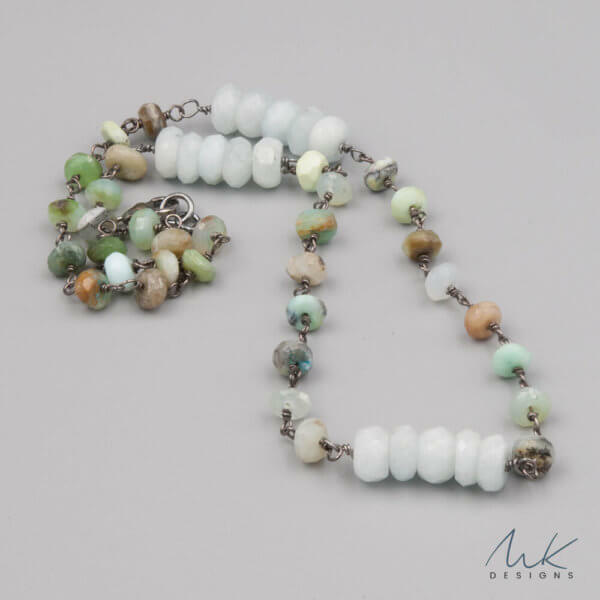 This Amazonite Peruvian Opal Necklace is more than an elegant handmade necklace- it’s a solution. When I reached into my closet for the umpteenth time searching for a piece of jewelry. Why couldn’t I find a necklace that was the perfect balance of grace and modern style? Designing the earth toned color way with a dash of subtle sparkle makes the colors pop in this necklace. Muted earthy greens, subtle brown, pale green turquoise and barely blue colors give this necklace an effortless feeling when worn. Timeless in style, hand-wrapped in sterling silver, Amazonite and Peruvian Opal brings a hint of mystery and balance. 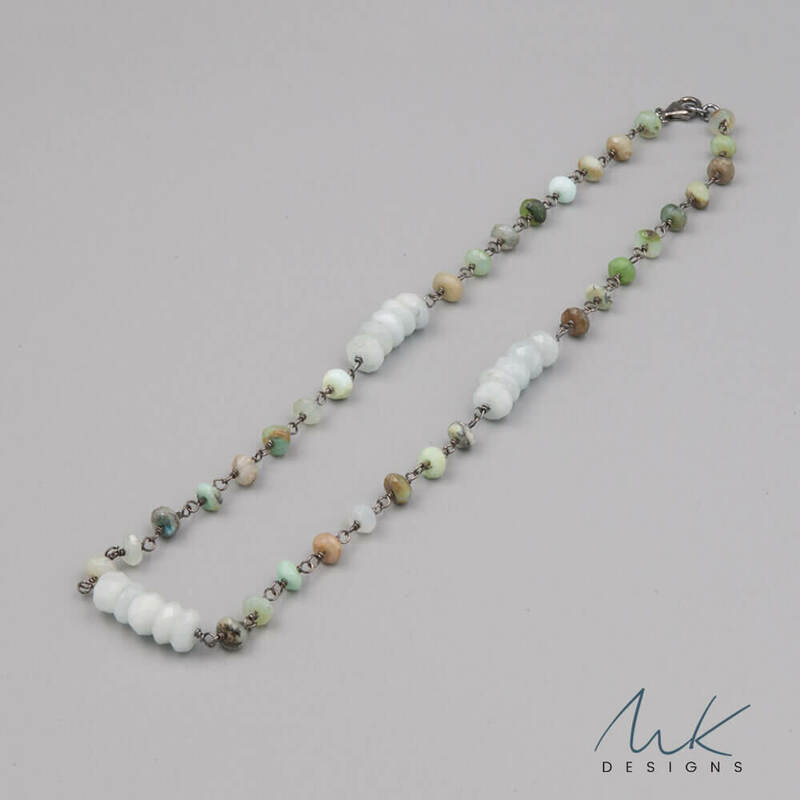 The dark gray color from the oxidized sterling silver metal provides the perfect balance of color and polish to the lighter amazonite and peruivan opal stones. Similarly, oxidized sterling lobster clasp holds this elegant necklace in place. No need to polish! Created to be the perfect accessory, this simply chic necklace gives punch to the neckline hanging at 18 inches. Did you know that every piece in my studio is created by hand? I hand form each necklace, with careful attention to selecting the best stones and finishes. I focus on selecting the most interesting colors, and balancing them with precious metals and fun finishes to make timeless designs that are curated just for you. You’ll love our amazonite peruvian opal necklace! 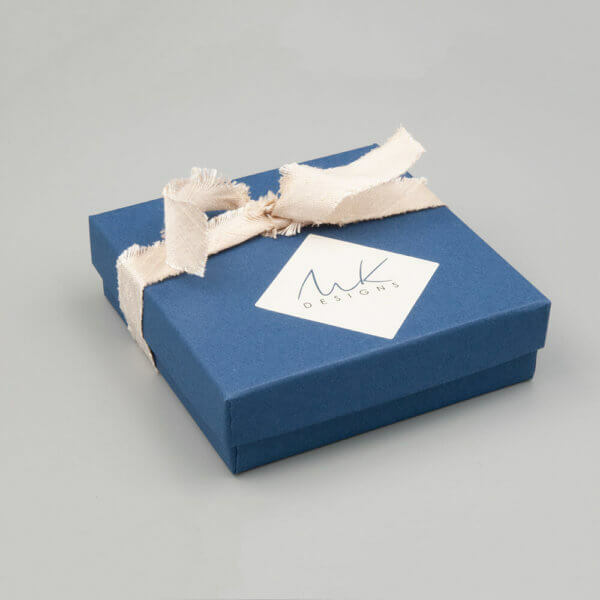 We package each necklace carefully in our gorgeous signature Navy boxes- because who doesn’t love opening a pretty package? Plus we always send your package fully insured and trackable- so that we you and I both know where your pretty jewelry is at all times! MK Designs stands behind all of our pieces- we love our Customers and want you to be happy! !